Leo Stein, Appreciation: Painting, Poetry, and Prose (New York: Crown, 1947), 174. Alfred Stieglitz and Edward Steichen mounted the first public exhibition of his work in the United States in March 1911 at 291 gallery in New York. The exhibition included twenty watercolors by Cézanne, the majority of which were landscapes. All of the works were lent by the Bernheim-Jeune Gallery, Paris. The show was roundly condemned, and even the organizers admitted that it did not showcase the artist’s best work. For an in-depth discussion of the exhibition, see John Rewald, Cézanne and America: Dealers, Collectors, Artists and Critics, 1891-1921 (Princeton: Princeton University Press, 1989), 129-51. Inspired by the 1907 display in Paris, the American painter Walter Pach published an article on Cézanne in Scribner’s Magazine in 1908 that captured the attention of Arthur B. Davies, and the two bonded over their admiration for the French painter. In the coming years, Davies would study Cézanne’s work in the collection of Henry and Louisine Havemeyer, which by 1907 included twenty-five of Cézanne’s paintings. For the article, see Walter Pach, “Cézanne – An Introduction,” Scribner’s Magazine 44 (December 1908): 765-68. For Davies’s response to Pach’s article and Cézanne’s work, see Rewald, 122, 126. Originally the organizers planned to devote an entire room to the artist’s work. However, when the Armory Show opened in New York on February 17, 1913, Cézanne’s works were displayed in Gallery Q alongside the paintings of fellow Post-Impressionist Vincent van Gogh. Elie Faure, Cézanne (New York: Association of American Painters and Sculptors, 1913), 41. Originally written by the French critic Elie Faure, the text was translated into English by Pach. 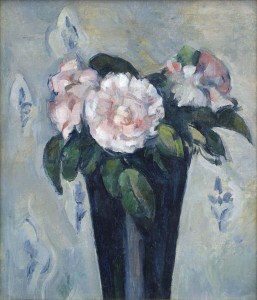 Gail Stavitsky, Cézanne and American Modernism (Montclair, NJ: Montclair Art Museum, 2009), 33.